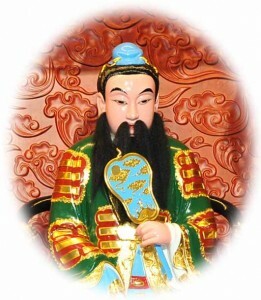 Patriarch Lü’s name was Lü Yan, styled Dongbin. His Taoist name was “chunyang” and he was commonly known as “chunyang-Zi”. An accomplished Taoist of the Tang dynasty, he was born on the 14th day of the 4th lunar month in the 12th year (638 CE) of the Zhenguan Era, in Yong-leCounty. 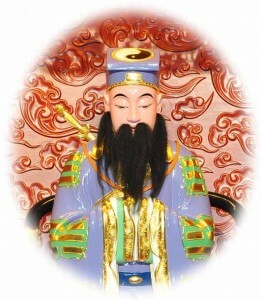 Patriarch Lü was the most celebrated immortal in the famous legend of the 8 immortals. 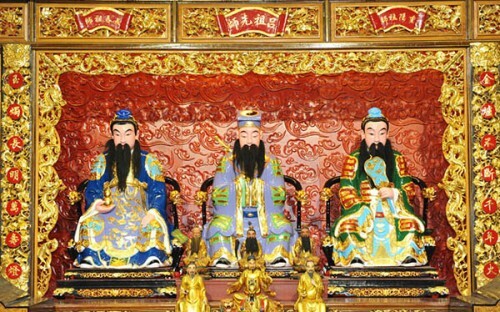 Patriarch Lü and Patriarch Han zhong-li are regarded as the grandmasters of Taoist Inner Alchemy. Patriarch Lü promised to save the people living in this turbid and turbulent world, and there were many stories about his salvation circulating in society, of which 108 stories where compiled to encourage loyalty and filial piety as well as promoting good ideas and dispelling bad sensual desires. Patriarch Lü is very popular among the Chinese in Southern China and Southeast Asia, especially Hong Kong where many temples honor Patriarch Lü as their main deity. An accomplished Taoist of the Jin dynasty, Patriarch Wang was the founder of the Quan Zhen Sec (Complete Perfection Sect) and one of the five Northern Patriarchs’. 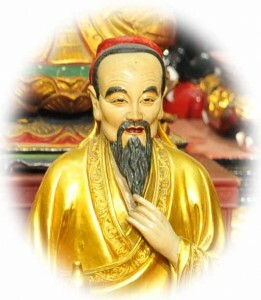 In terms of theory and the practice of Taoism, Patriarch Wang advocated the view of the integration of the three Doctrines (Taoism, Buddhism and Confucianism), that is, the integration of Confucianism, which values rationality, Chan (Zen) Buddhism, which values spiritual cultivation, and Taoism, which values the cultivation of bodily life. He encouraged Taoist of the Complete Perfection tradition to read the Taoist book of the Purity and Tranquility (Qing-jing Jing) and the Book of Dao and its Virtue (Daodejing), The Buddhist Prajna Heart Sutra, and the Confucius Book of Filial piety. “Complete Perfection” means being complete in terms of one’s Essential Matter, Vital Breath, and Spirit (Jing, Qi, Shen) to the extent of being perfect, never polluting any one of them. In terms of Taoist practice, Patriarch Wang opposed the practice of Outer Alchemy, Talismans and Registers, and the Arts of Exorcism, and stressed the cultivation of our spirit before the cultivation of the body. Patriarch Wang demanded the Complete Perfection Taoist followers lead an ascetic life by controlling themselves, being humble and honest, practicing pristine cultivation and self-vexation, and vegetarianism. Only in this way, according to Wang, can they better cultivate themselves and assist the world, finally overcoming material desire and attaining sainthood. Known as the “King of Chinese Medicine”, Sun Simiao was a very famous Taoist priest, and also a great physician of the Tang dynasty. He wrote several texts on Chinese medicine and he treated countless patients regardless they were rich or poor. He lived over a hundred years, and yet his hearing and sight were perfect, his mind and though were still clear. People regard him as “longevity star”, and see as an immortal. Zhang Zhongjin was a famous physician of the Eastern Han dynasty, and wrote 2 books which were honored as “Medical Scriptures” and both books are 2 of the 4 greatest Chinese Medicinal Books. 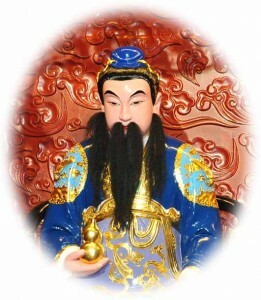 Perfect Man Zhang Zhongjin was also referred to as the “Sage of Medicine”. Hua Tuo was a distinguished physician of the Eastern Han dynasty, and he was very popular with the people. One of the most regarded physician in China’s history, he was also one of the first physicians to devise exercises to enhance health. He developed a series of exercises based on the movements of five animals (tiger, deer, bear, ape and crane) known as wuqinxi, or “Frolics of the Five Animals”. He made enormous contribution to medical studies and made many breakthroughs in Chinese Medicine, especially the invention of the Mafei powder, where he conducted surgery with the aid of the anesthesia. 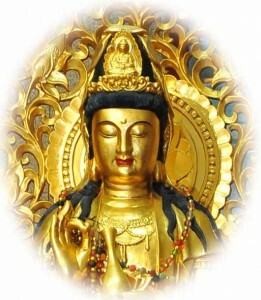 Cihang Zhenren, literally meaning Compassionate Travel True Person or the True Person who traverses with Compassion, is a common deity in Buddhist and TaoistTemples. 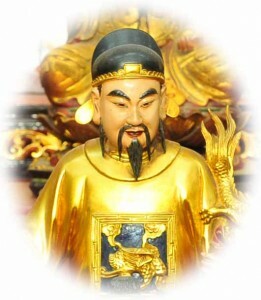 Cihang Zhenren is a Taoist Immortal who is considered by some to be identical to the Buddhist bodhisattva Guan Yin, and one of the twelve disciples of the Primeval Lord of Heaven. The accounts of origin of Cihang Zhenren appear in two Taoist books “History of the Immortals” and “Lingbao Spontaneous Celestial Text”.